# As you know that a variable can only store value one value at a time. # sometimes you want to create a lot of variable with the same type, So do you going to create each of them or Why do not you look at array? What if offers for you? # An Array is a series of elements of the same type placed in contiguous memory locations that can be easily accessed whenever wanted. # Why Array was implemented ? # Instead of creating a lot of variables that will take more memory that will be better if we can declare an array in such a manner that can hold our all variables contents just using a single identifier name. # How to declare an Array? # How to declare an Array using C++? # Let me declare an Array, so that i can put content there. # We just declare an static array that can hold 5 integer values. # How to declare and initialize an Array? # How to initialize Array using C++? # remaining Array elements will be initialize to ZERO. # Compiler will assume that length of Array will be number of initialized elements. # How to access values of an Array? # You need Index number of array element that you want to access. # Numbering starts from ZERO. # What about Multidimensional Array? 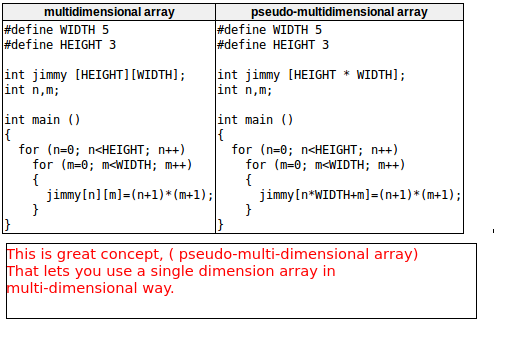 # Multidimensional Arrays are nothing more than Array of Arrays. # Means, an Array element will be an Array itself. # just declared a multidimensional array. # What if i want to pass my Array as a function parameter? # To accept an array as parameter for a function, the parameters can be declared as the array type, but with empty array brackets, omitting the actual size of the array. # This function expects an Array of type Int. # Is there any standard library to play with Array? # In C++ array are inherited from C language. # C++ has an alternative array type as a standard container. it is a type template ( a Class template) defined in header <array>. # If you are using standard C++ array container then they give you some powerful methods that you can use with them.